First, I have a winner for the stencil giveaway. It is Cindy Holmes. 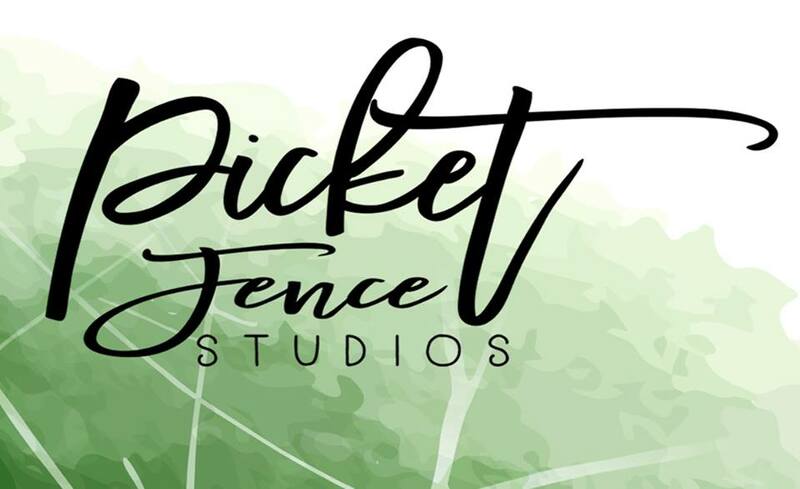 Please contact me so I can forward your email to Picket Fence Studios!!!! There is a Contact Me form on the right hand side of the blog. Second I have a quick card. 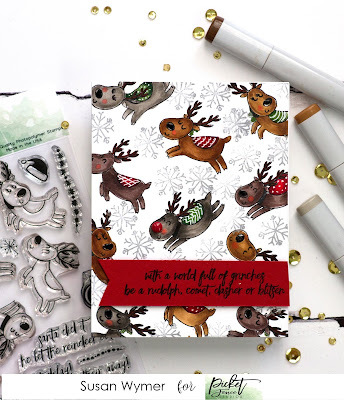 I love these flying reindeer and the sentiment from Santa's Sleigh Ride stamp set.. I first stamped the reindeer in a pattern on Neenah Solar White 90lb card stock and then used various shades of brown copics to color them in. I did give Rudolph a red enamel nose - I just had too...lol! I then stamped the snow flake using a grey pigment ink. 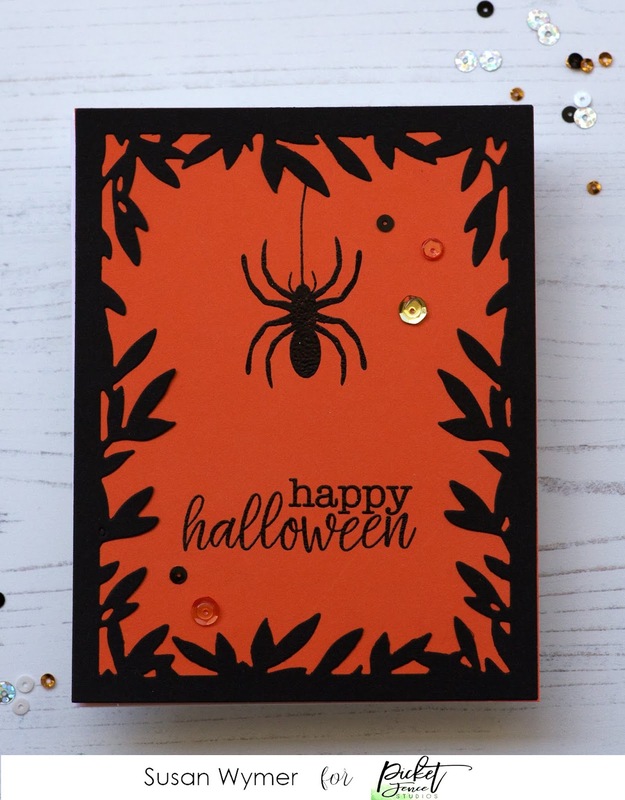 Easy card to make. Thanks for stopping by and enjoying an early winter lol! See you soon! Links to product: I am using affiliate links at no further cost to you! As part of the design team I received the stamp set for free. Just a quick post and video today. I recently purchased most of W Plus 9's latest release. I couldn't help myself.....and I may purchase more LOL! I made this card using the mandala and the next to the smallest hexagon die. It was so easy to make. The sentiments are also from the Butterfly Mandala set. Really a great buy. I have more cards planned with it. In order to make the card, I found three coordinating pieces of card stock - any 3 colors will work. I then stamped the mandala on to them with Versamark ink and heat embossed with Hero Arts Fine Detail White embossing powder. 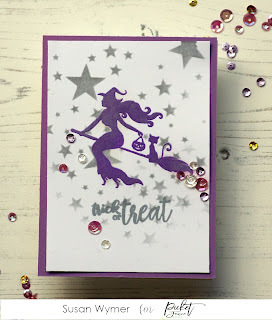 I used my MISTI for all my stamping. Then using the next to smallest hexagon die, I just die cut many pieces of paper. I arrange them all in a pattern and trimmed the background down to size. 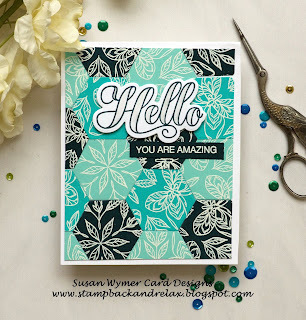 I then stamped the hello sentiment in W Plus 9 Nautical Navy and filled in the white areas of the letters with clear Wink of Stella and some Glossy Accents. While that was drying, I stamped the smaller sentiment onto the darkest card stock and embossed with the same Hero Arts embossing powder. Easy peasy card to make! I hope you give it a try with whatever you have in your stash! Thanks for stopping by! I will be back later in the week. 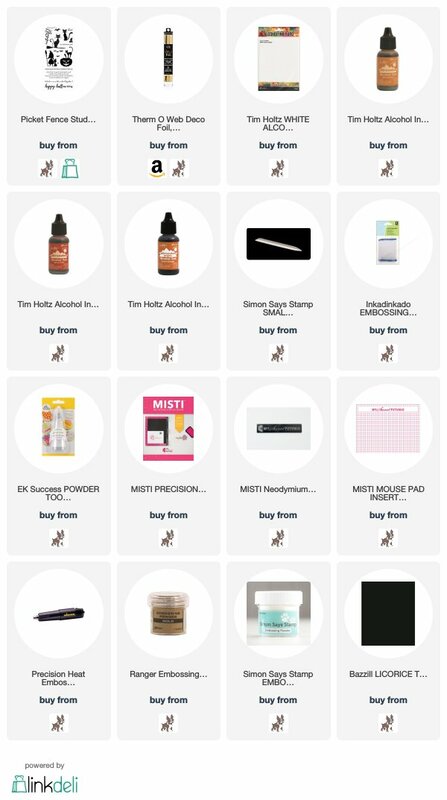 Links to products used: I am using affiliate links at no further cost from you! I am up on the Picket Fence Blog today with a cute, foiled Christmas card using the String of Lights of stamp set and Kaleidoscope background stamp from Simon Says Stamp. Below is a You Tube video - ok minus some important footage - on how I made this card! Products Used: I am using affiliate links at no further cost to you. 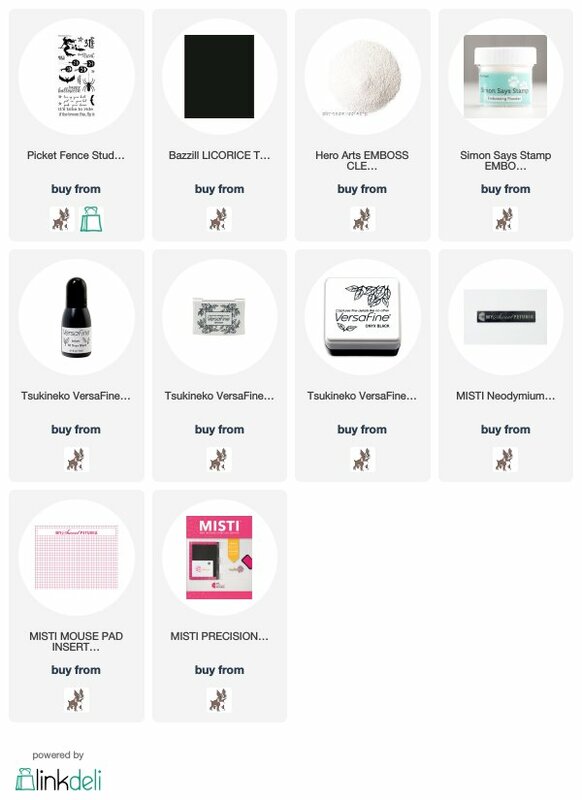 These are all products I love and have used! Just popping in with a fun giveaway. Nicole from Picket Fence Studios is generously letting me give away a set of the three circle and mask stencils. I used the medium sized stencil with my Life Changing Blender Brushes to make this card. You can see the three stencils in the photograph. Please leave a comment below and the winner will be announced next week! I used Distress Oxide Lucky Clover to blend into the circle. I then stamped Santa and the sentiment using Memento Tuxedo Black. I colored all this in with Copics but you could use colored pencils. 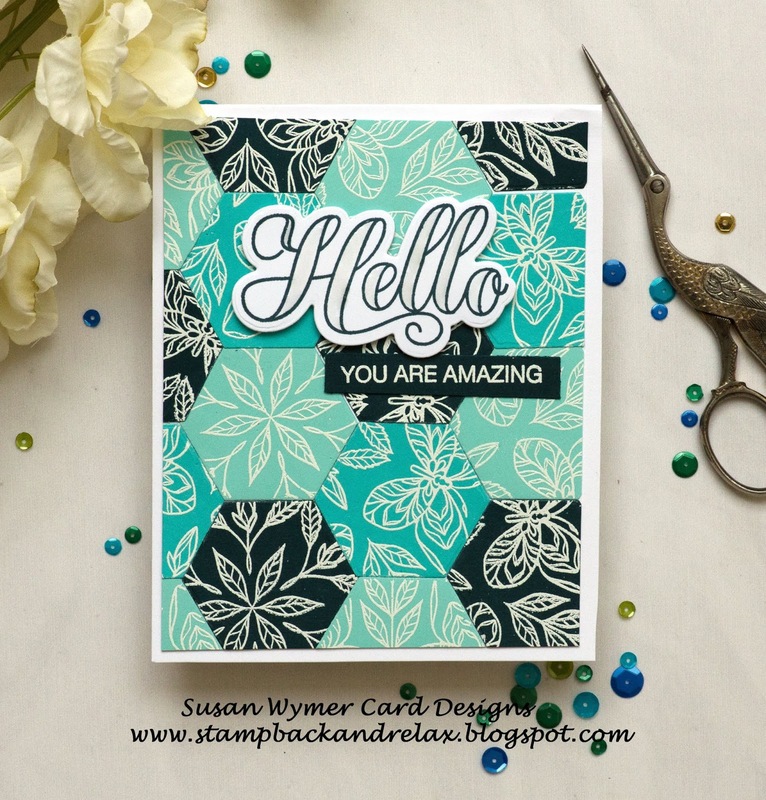 I stamped the greeting with Versafine Onyx Black ink. At the end I splashed on some Sheer Shimmer spray. Products Used: I am using affiliate links. I receive a small commission at no extra charge to you. At times, I receive product for free for work done on design teams. 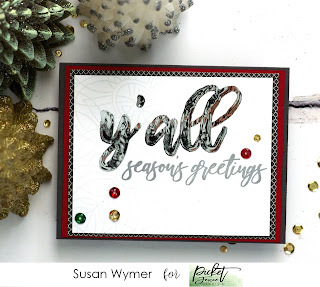 I love this new Holiday release from Picket Fence Studios. I made four cards using a few of the amazing sets from this release from Picket Fence Studios. I have a few more cards in the pipeline -lol! 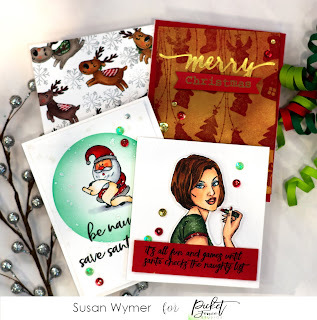 I have a You Tube video tutorial, linked below, on the girl going to a Christmas party card. In the next few days, I will post here on how I made the other three cards with close-up photos of them. I started off by embossing an A2 card with a snowflake embossing folder. The embossing folder is from years ago but I will try and find one similar to link below. I stamped the image with Memento Tuxedo Black using my MISTI and began the Copic coloring process. I made, remade and then remade the card - in the video you will see it all and my mess of a desk! Links to Products below: I am using affiliate links at no further cost to you. I am given the new release stamps as part of my work as a design team member. However, I would not use these products or the ones linked below unless I loved them! I think this is my favorite of the Halloween cards. I stamped the witch from Wicked Together in Distress Oxide Seedless Preserves and overstamped with Versamark. I then used clear embossing powder to heat emboss. I found a star stencil - an old one so I found something similar and linked that up for you - and applied Hero Arts Silver ink using the blender brushes. It was such an easy card to make. I added some sequins from Hero Arts. I mounted the panel on an A2 sized purple panel. Thanks for stopping by. See you soon with a new season of cards! Product List: Compensated affiliate links are being used at no additional charge to you! 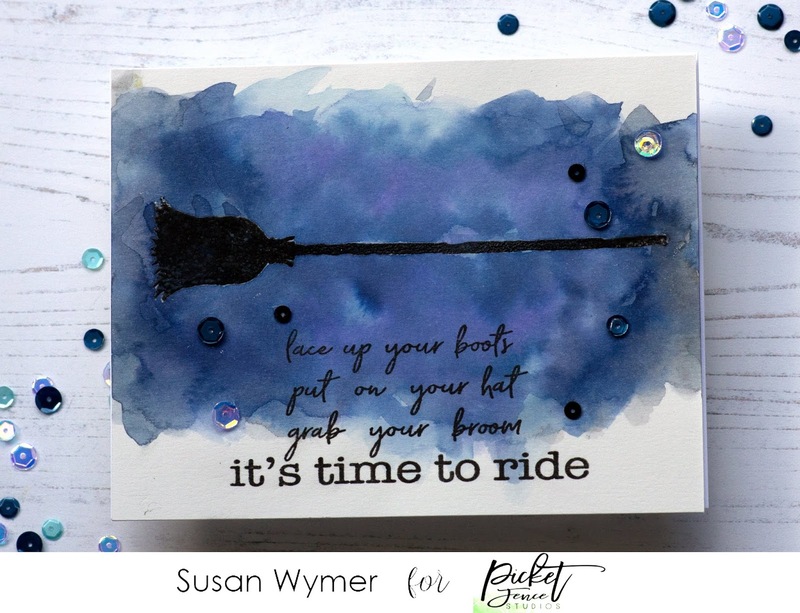 For this Halloween card, I used several blue shades of distress oxide on a Distress watercolor paper to make a blue border for my broom from Yes I Do Drive Stick. I stamped the broom with Versafine Onyx Black ink and used clear embossing powder. I then stamped the sentiment from If The Broom Fits using Versafine Onyx Black ink. This was so easy to make. I finished it off by adding some sequins from Simon Says Stamp. Product Links: Compensated affiliate links are used at no additional cost to you. I just could not resist playing with my alcohol inks and some gold foil. I added the inks in different layers onto Yupo paper and blew them around a bit with a straw. I let this dry for 1.5 minutes as recommended by Kelly Latevola and then added the Deco gold foil. SOOOOO much that I had to heat emboss the pumpkin and cat with clear embossing ink on black card stock. I ran this image covered with gold foil through my laminator without a carrier sheet. I love how it turned out. The sentiment was heat embossed with gold embossing powder. I added some gold sequins here and there to finish out the card! Thanks for stopping by! I should have a new video up soon! Products Used: Compensated affiliate links are being used at no additional cost to you. 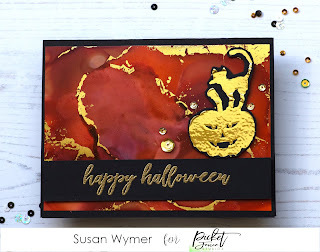 I had fun making this very traditional Halloween card using some Picket Fence Studio stamps and a frame die from W Plus 9. I heat embossed the spider and sentiment from If the Broom Fits. 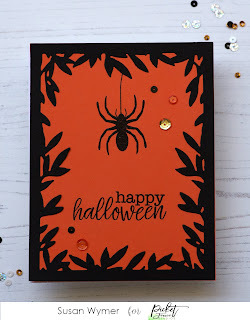 I stamped first in Versafine Onxy Black and then using clear embossing powder to heat emboss. I did the same with the sentiment. I then die cut the frame from Bazzill Licorice card stock. I added a few sequins and called it done! Links to products: Affiliate links are being used at no extra cost to you.